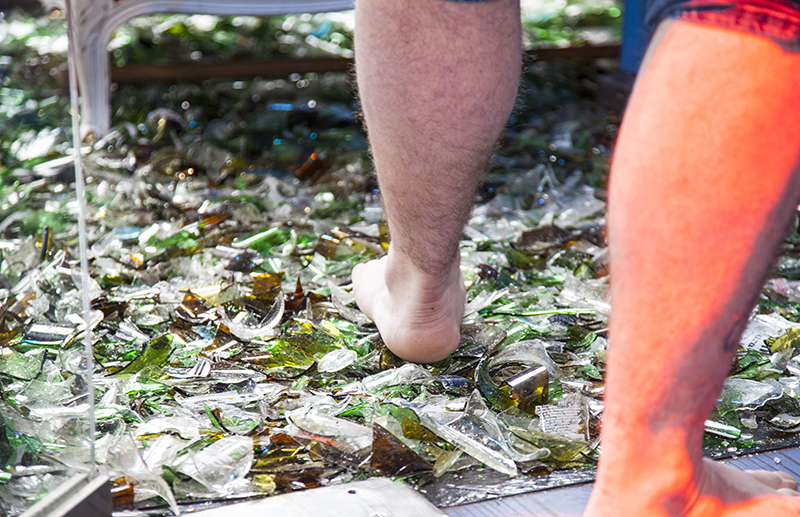 Tim Horsting is a stunt artist that eats glass for breakfast. He recently decided to spend 7 consecutive days in the glass box entrance of a museum, being locked up! His goal with this performance during the Dutch National Museum Week is to raise awareness of the ongoing humanitarian crisis in our world. This stunt is inspired by David Blaine and the Serious Request’s yearly “Glazen Huis”. Tim isolates himself from the outside world in a glass cage for a whole week at Dam Square in Amsterdam. The 6m2 space, equipped with the basic needs, such as a toilet, a sofa, food and water and crushed glass covering the entire floor. 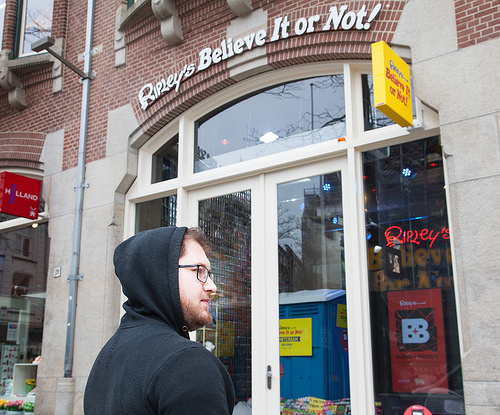 Visitors of Ripley’s Amsterdam could see Tim perform various magic tricks, stunts and eat actual glass. On April 8th, Tim regained his freedom at our “Release Party”. Visitors were invited once again to come out and ask questions, take pictures and get autographs. Through this one-week event, Tim and Ripley’s Amsterdam brings awareness of important work that organizations such as Doctors Without Borders carry out. The cage that Tim lived in represents the uninhabitable conditions that refugees or people living in extreme poverty have to deal with. It also embodies the need for these remote places to be accessible to professionals in areas such as healthcare and education. All of the money from donations for this event will be directed to the Doctors Without Borders foundation. *It is not too late! You can still make a donation towards the Doctors Without Borders Foundation now at the Odditorium. A theatre prodigy since his school years, Tim Horsting combines magic tricks and theater performances with weird objects and mentalism in his acts. Horsting is constantly developing himself by learning and discovering new skills. His performances are seen at festivals, events, television and on the streets. Besides The Netherlands, he has performed all around the world in countries such as Great Britain, Ireland, Czech Republic, Belgium and France. In 2015, he features as a guest mentalist in the TV show MindMasters Live. Since 2016, he is the creative director at T!PEAUX creative production company Wageningen. Ripley’s Believe It or Not! Amsterdam showcases the world’s most remarkable collection of natural, scientific, artistic, and human oddities. Meet the people who made it into the book of Guinness World Records or hear the stories of rare art pieces collected by the curious explorer and world-traveler, Robert Ripley.